Here at the luxurious Hotel de Rome we are proud to offer our guests both quality service and accommodation in a fantastic location right in the heart of Rome’s city centre. 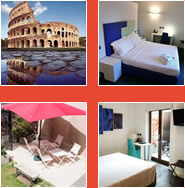 If you are looking to explore the truly beautiful city of Rome and all its wonder and magic, then you’ll be delighted to know that our fantastic location near the Colosseum lets you do just that, with exceptional ease, convenience and little expense. As you can see from the map above, our luxury Hotel near the Colloseum is in the heart of this vibrant city. Opposite the hotel is the incredible Roman Forum and just a stones throw away is the awe inspiring Colosseum. From there why not walk up the Palatine Hill for spectacular views across Rome reaching out as far as the Vatican and St. Peters. The majority of Rome’s tourist attractions and monuments are within walking distance of the hotel, the Trevi Fountain, the Spanish Steps, Piazza Venezia, to name but a few. As for the area in which our hotel is located, Rione Monti, you will find many trendy boutiques and wine bars as well as pubs and an array of fantastic restaurants. Leonardo da Vinci (Fiumicino) Airport is connected to Termini by the Leonardo Express Train by day but to save a pretty penny, you can take the non-express train for about a third of the price. Ciampino Airport is connected to Termini by multiple coach services - buy your tickets on the ground rather than on the plane to avoid lines and inflated prices.